Clothing and other sorts of bodily adornment represent an important means by which individuals and groups express their identity. Garments, hairstyles, and the display of related possessions may reveal the nature of a person’s relationship to his or her contemporaries, whether with respect to religious belief, gender, age, ethnic affiliation, status, or membership in a kin group. These practices are culturally specific, but may share certain features with more distant communities through trade, political or military contact, or the desire to emulate powerful or ancient models. Mores regarding personal appearance thus often serve to reinforce the social order, just as their violation may challenge the status quo. As a consequence, the existence of specific sorts of dress to distinguish particular social groups may indicate important hierarchical divisions existing within a society that are not tied solely to legal rank or social status. 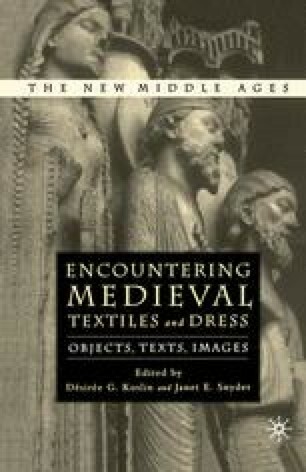 Keeping in mind that laws prescribing personal appearance preserve the ideals of a regulating body rather than reflect what actually occurred in that kingdom or religious community, evidence for clothing nonetheless allows scholars to understand how nuances in the expression of difference in historical and contemporary communities are valued by their leaders.